A travel insurance policy for Breaking Dawn 2’s Edward Cullen! If you are lucky enough to enjoy cherished holiday memories or are about to embark on the trip of a lifetime, you could put pen to paper to share your experiences with other travellers. 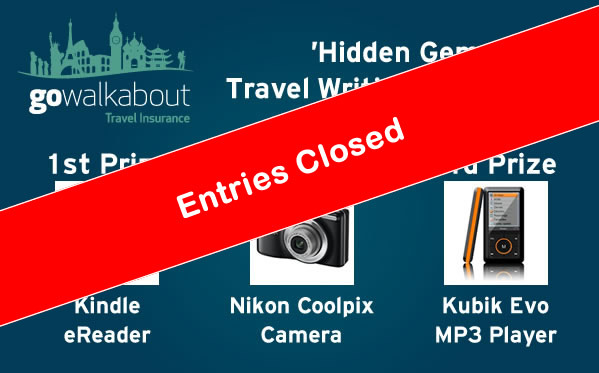 Write a descriptive article entitled ‘hidden gems’ and you could win one of the fantastic prizes described below. Your article should shine a light on an aspect of your trip that you feel is deserving of a wider audience. Have you discovered an idyllic spot that provided unexpected pleasure? Have you been on a tour that illuminated your knowledge of an area? Have you taken part in an activity that was the highlight of your time away? If you have, your brief is to compose a piece of up to 500 words that will convince every reader that they too want to be where you were! To make sure that your entry stands out from the crowd, you are welcome to include a photo that illustrates your magical experience. – Holds up to 1, 400 books – take your library wherever you go. If you’d like to enter, please do so by the 28th of February 2013 using the entry form below. Before entering, please read the terms and conditions at the bottom of the entry form and get in touch if you have any queries.